Promoting the fast and efficient development of the Information Society is a major objective of the Hungarian Academy of Sciences (HAS). 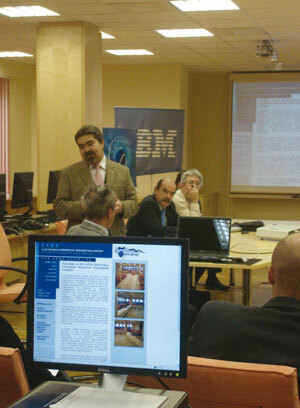 Accordingly, in January 2006 SZTAKI, the Computer and Automation Research Institute of the HAS, established the E-governance Competence Centre (ECC), dedicated to developing and promoting applications for e-administration. The ECC Presentation and Education Centre. The foundation of ECC was motivated by the fact that no independent professional organisation existed in Hungary to provide joint expertise in legal, administrative, and technical issues simultaneously; such an organization is essential in building and promoting general e-administration. preparation of publications and e-learning syllabuses. Recently, the ECC undertook two projects. We defined the conditions necessary to establish a new person (client) identification system, including a proposal for a new data protection law to be placed on a new constitutional basis. Hungary has accepted the data protection proposals of the European Union, meaning there are legal difficulties in connecting databases containing client data with each other. Our other project was the elaboration of the theoretical basis of the public administration infrastructure, which enables the widespread use of electronic administration and electronic signatures. According to the Hungarian law, electronic documents can be issued by the authorities only if qualified electronic signatures are attached. In Hungary, four certificate authorities offer electronic signatures, but due to legal difficulties, none is able to provide qualified electronic signatures. Governmental executives have made it clear that there is a strong demand for our work. In order to improve and expand the prepared proposals, we organized a conference at the Institute for Legal Studies of the Hungarian Academy of Sciences. In the period 2007-2013, the European Union will place at Hungary's disposal a development fund worth 22.4 billion euro from the Structural and Cohesion Funds. However, the developments will not be financed exclusively by the EU, and must be complemented by domestic funds. For utilizing this financial fund, the Hungarian Government developed a strategic document for the EU, namely, the New Hungary Development Plan (NHDP). We participated in the preparation of this plan, in the State Reform Operational Programme, and in the Electronic Administration Operational Programme. The latter two programmes describe the detailed objectives of the NHDP. Recently, we have contributed to the Action Plans that belong to the Operational Programs for the Prime Minister's Office and for the National Development Agency. In the second semester of 2006 we established the ECC Presentation and Education Centre. Here we present proven e-governmental applications for governmental and municipal organizations. This activity will be expanded both quantitatively and methodologically, since in 2007 the number of market participants in the e-government sector will increase from fourteen to more than twenty. As a qualitative improvement, we will commence operating an ASP (Application Service Provider) centre in 2007, which will provide qualified e-governmental applications for e-municipalities. At the request of governmental executives, we established a Hungarian-Austrian workgroup, which collects and presents international experience in developing and using citizen e-cards. In Austria each citizen has his/her own multipurpose e-identity card, and we would like to implement a similar initiative in Hungary. Since we consider the wide-ranging familiarization and acceptance of the results of e-governance to be especially important, we organize conferences and other programmes, and prepare professional e-learning materials. Among other things, we have organized several conferences with the aim of improving the e-governance knowledge of the civil service, and have completed the first two professional educational DVDs in the 'Electronic Governance' e-learning series. Our experience in e-governance and the methodologies that we will develop in the near future will make it possible to catch up with those countries where computer techniques are widely used. Moreover, these experiences can be handed over to other similar countries, making them valuable in international relations.